Travel in five-star style and luxury to one of the most incredible natural wonders of the world in a helicopter specifically designed for sightseeing. 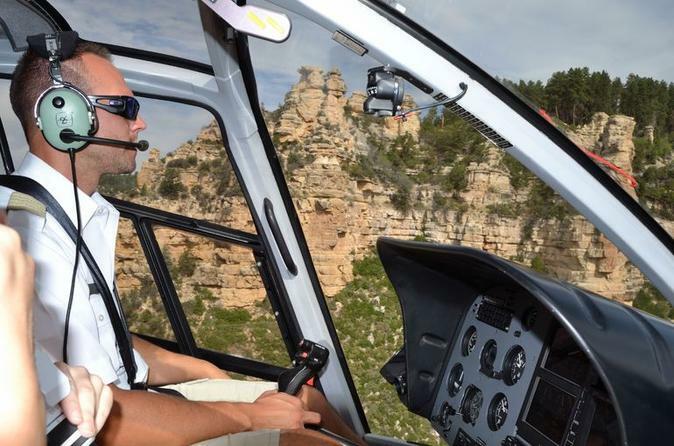 On this Grand Canyon flightseeing tour from Las Vegas, your pilot will provide informative commentary as you enjoy spectacular aerial views of the Hoover Dam, Lake Mead and the Black Canyon before soaring over the mighty Colorado River and into the majestic Grand Canyon. Don't miss this unforgettable experience! 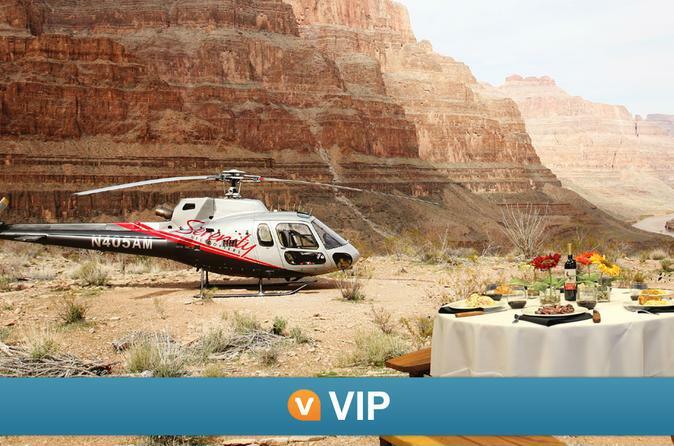 Experience the Grand Canyon like a VIP on this luxury helicopter tour during sunset. From Boulder City, enjoy a magical helicopter flight over Lake Mead and Hoover Dam to the Grand Canyon West Rim, and land for an all-out gourmet dinner complete with fine china, silverware, table linens and flower decorations. As you savor your meal and sip Champagne, you'll be treated to a beautiful sunset over the canyon -- an unforgettable experience! This exclusive Viator tour can’t be booked anywhere else! Get out of the hustle and bustle of Las Vegas and explore some of the vast land that surrounds the Grand Canyon. 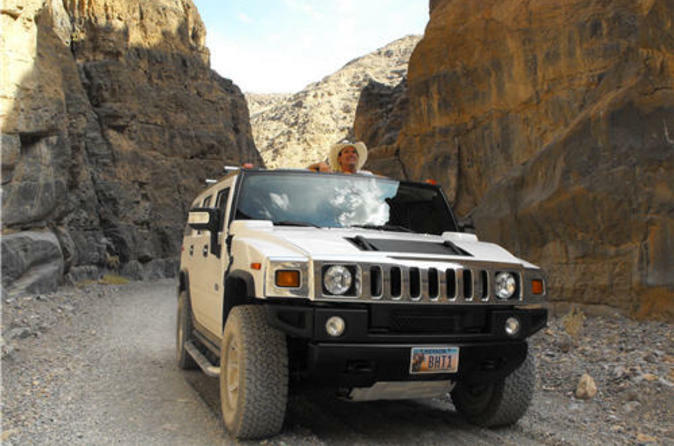 On the Grand Canyon West Rim tour, you’ll see ancient Joshua tree forests and the lands of the Hualapai Indians as you ride to the Grand Canyon in a Hummer H2. Upgrade options are available, and lunch is included. 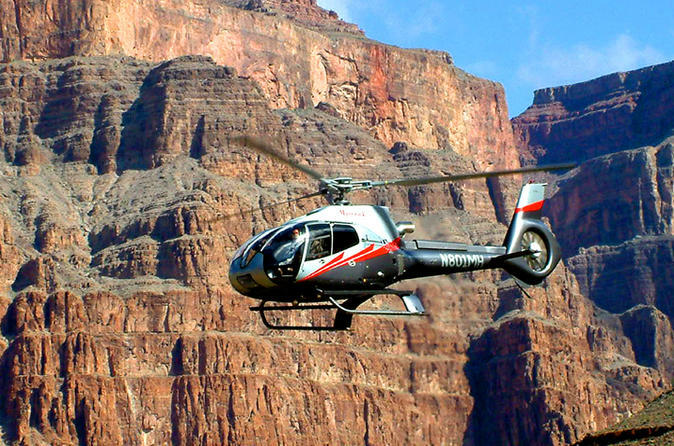 Take in breathtaking views with a Grand Canyon helicopter tour from Boulder City, Nevada. You’ll soar over the Grand Canyon during a 35-minute helicopter flight each way, landing in the depths of the canyon for a Champagne picnic. Choose the sunset departure for an upgraded experience where you'll enjoy the Grand Canyon at it's finest. As you fly out of the canyon you'll admire the changing colors as the sun sets in the horizon. 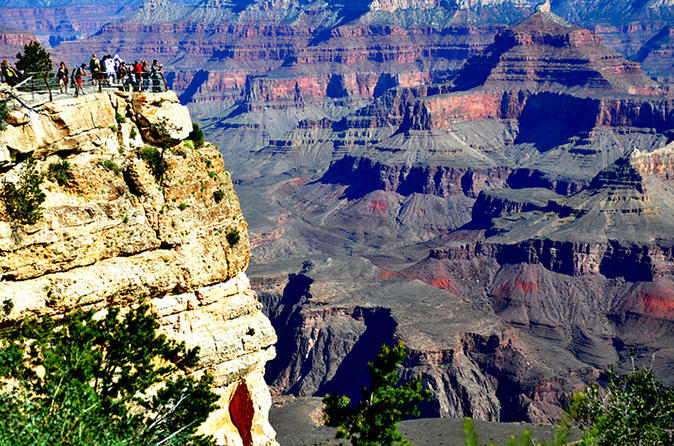 Go for the combo: Travel to the Grand Canyon West Rim from Las Vegas by luxury Tour Trekker, fly in a helicopter to the bottom of the Canyon, cruise down the Colorado River, then spend time at the West Rim. 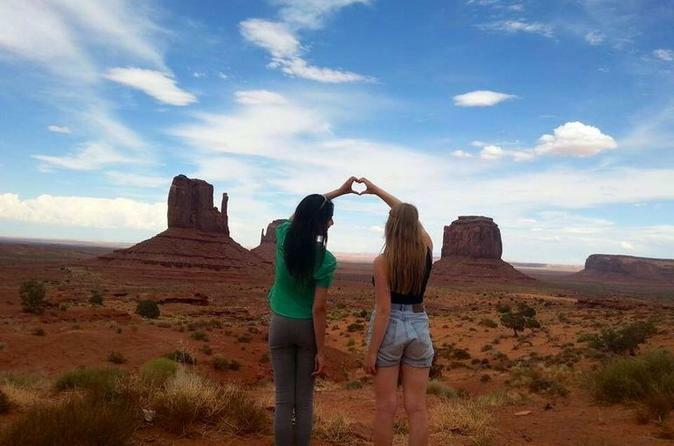 It's one of the best ways to experience the Grand Canyon, as traveling by SUV ensures tour group numbers will be small and you'll enjoy a more personalized visit. You get to choose how you see the Grand Canyon South Rim on this breathtaking tour from Sedona. 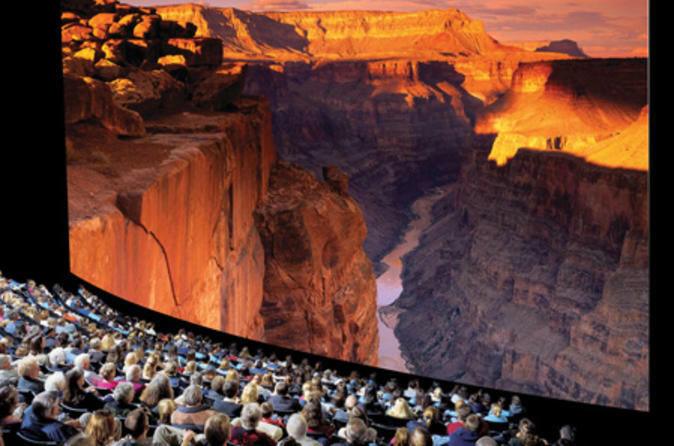 Perhaps you'd like to see the IMAX movie, maybe enjoy a bird's eye view over the Canyon in a helicopter, or why not ride the historic Grand Canyon Railway? Whatever option you choose, you're guaranteed to see some of the most spectacular sights on earth! Combine a Grand Canyon helicopter flight with a river float down the Colorado River for an incredible and exciting day tour from Las Vegas! 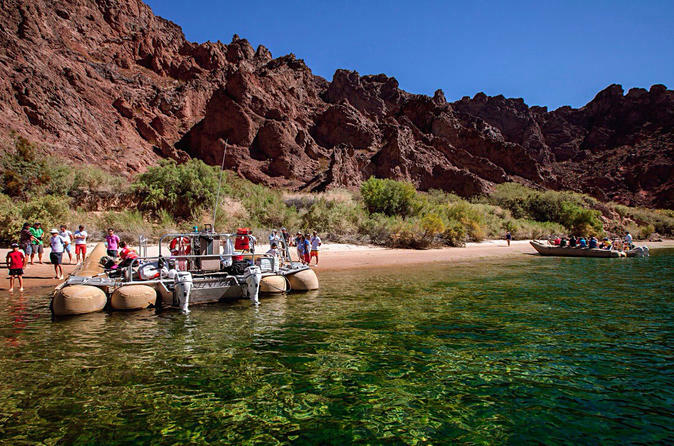 Start your day with a scenic 60-minute helicopter flight over Hoover Dam, Lake Mead and the Grand Canyon's West Rim before enjoying a relaxing river float down the Colorado River and through the Black Canyon with your informative guide. Keep an eye out for big horn sheep, osprey and great blue heron as you head down the river, where you’ll stop for a swim at a secluded beach. Enjoy a picnic-style lunch and shopping in Willow Beach, Arizona, before returning to your Las Vegas hotel. Visit three national parks of the American Southwest on this 3-day seasonal camping adventure from Las Vegas, with the option of comfortable lodging. See Zion National Park, Bryce Canyon and the Grand Canyon — where an optional helicopter ride takes you over the South Rim — plus explore Monument Valley on a Navajo-guided Jeep tour. Transportation by air-conditioned minibus, park entrance fees and camping accommodation/equipment (or lodging upgrade) are included. This small-group tour is approximately 14 people for a more intimate experience with a knowledgeable guide. 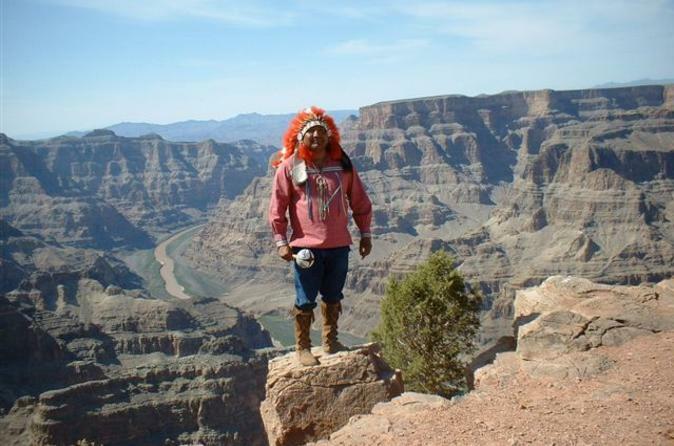 Enjoy spectacular views at the Grand Canyon South Rim and East Rim, and pick up a native American souvenir on this full day tour from Flagstaff. 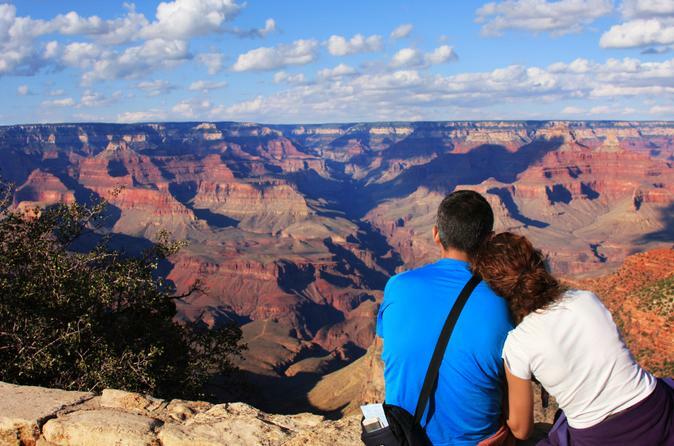 Admire the views from the best vantage points during your Grand Canyon day trip before finishing your tour with shopping at Cameron Trading Post. 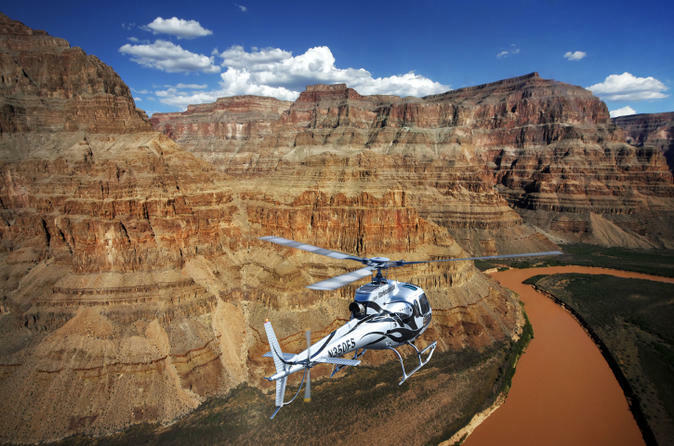 Soar over Hoover Dam, Lake Mead and the Colorado River on this exhilarating Grand Canyon helicopter tour! Taking off from the Las Vegas heliport, admire incredible bird’s-eye views of the Grand Canyon aboard a comfortable, state-of-the-art helicopter. On your return, fly low over the dazzling Las Vegas Strip. 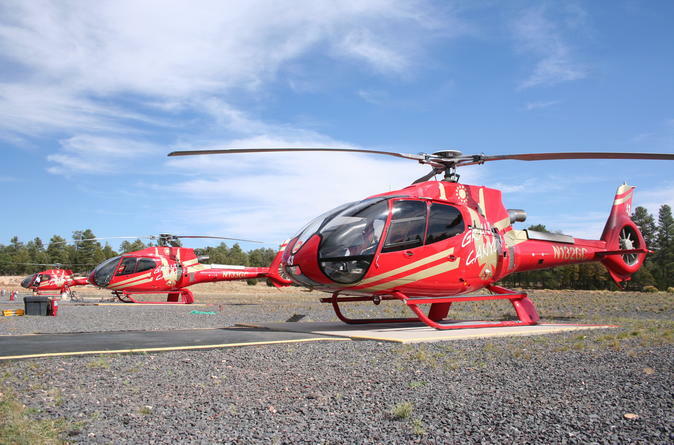 This helicopter tour is a great value, and the perfect way to see the Grand Canyon's highlights if you're short on time. Please note: hotel pickup and drop-off is not included. 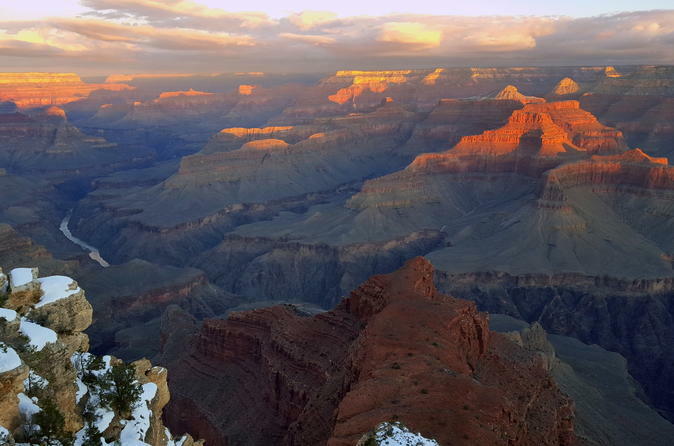 Explore the Grand Canyon National Park on this day tour from Flagstaff. You'll tour in comfort as your guide teaches you about the geology and history of one of the Seven Natural Wonders of the World. Hotel pickup, drop-off, entrance fees, lunch, bottled water and snacks are all included. 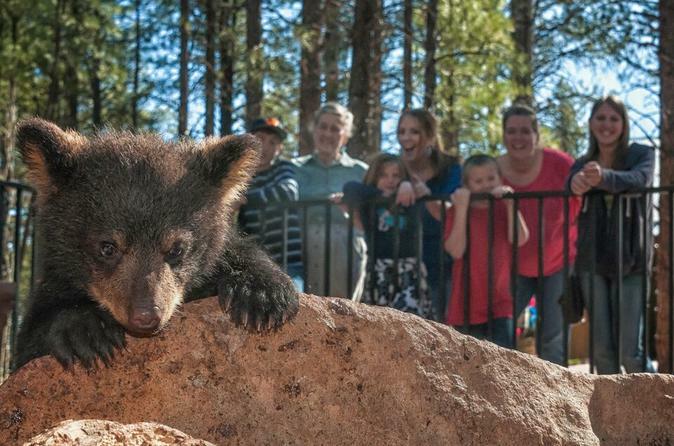 During your Grand Canyon vacation, see bears, bison, big horn sheep and more at the family-friendly Bearizona Drive-Thru Wildlife Park. Drive through 3 miles (4 km) of Arizona wilderness in your own vehicle, viewing North American wildlife like black bears and Alaskan wolves! Plus, you can also tour Fort Bearizona, a walk-through area where baby animals and smaller species of wildlife can be seen up close. 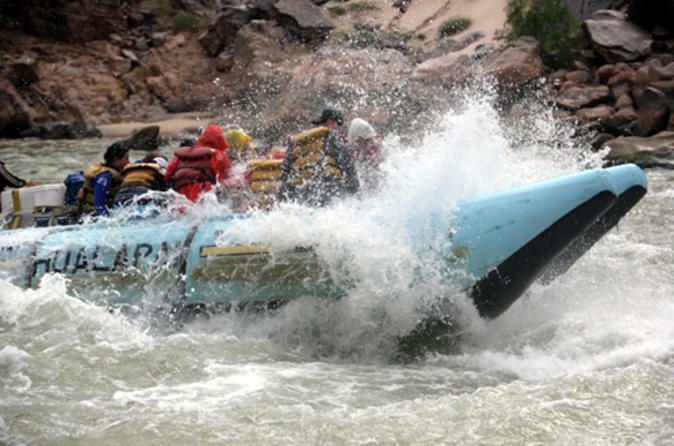 Experience a thrilling adventure as you raft down the mighty Colorado River along the sheer cliffs of the Grand Canyon. Also included in this exciting white water rafting day trip from either Flagstaff or Las Vegas is a 4,000-foot (1,200-meter) helicopter transfer to the West Rim of the Grand Canyon. Depart from the Grand Canyon airport in Tusayan, Arizona for an exhilarating 25-minute scenic flight out of the South Rim of the Grand Canyon over the Kaibab National Forest. 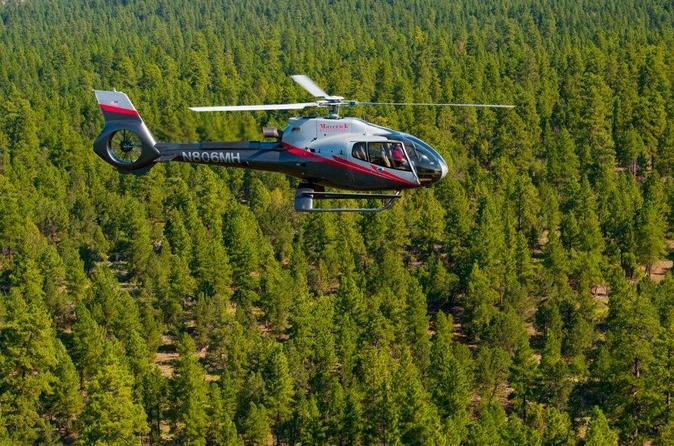 Aboard the state-of-the-art ECO-Star helicopter, enjoy breathtaking views through wraparound windows as you fly over the mighty Colorado River towards the Canyon’s North Rim. See the Tower of Ra and Vishnu Schist as you fly back through the Dragon Corridor, the widest and deepest section of the Grand Canyon. Your daylong expedition starts at the Grand Canyon Airport (South Rim) with a 1-hour plane ride over the Grand Canyon's East Rim, the Colorado River, and Lake Powell. 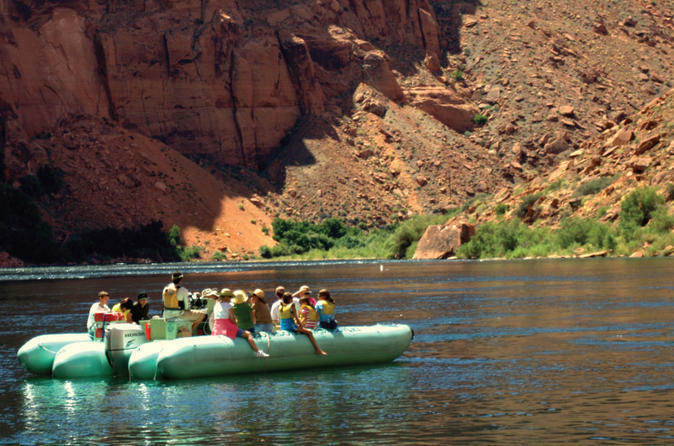 Then receive a picnic-style lunch and board your motorized raft to float 15.5 miles (25 km) along the Colorado River through Glen Canyon as your guide talks about the history and geology of the area. A 30-minute hike and continental breakfast are also included. 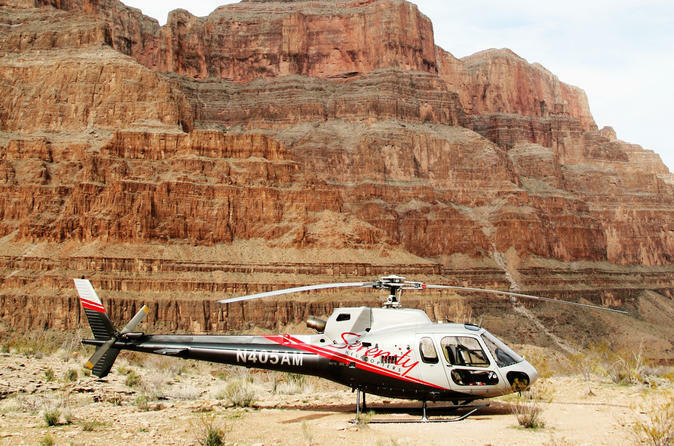 Enjoy an unforgettable Grand Canyon experience with this VIP morning helicopter tour from Las Vegas. Take off from Sin City on a magical helicopter flight over Lake Mead and Hoover Dam, with onboard narration from your expert pilot. 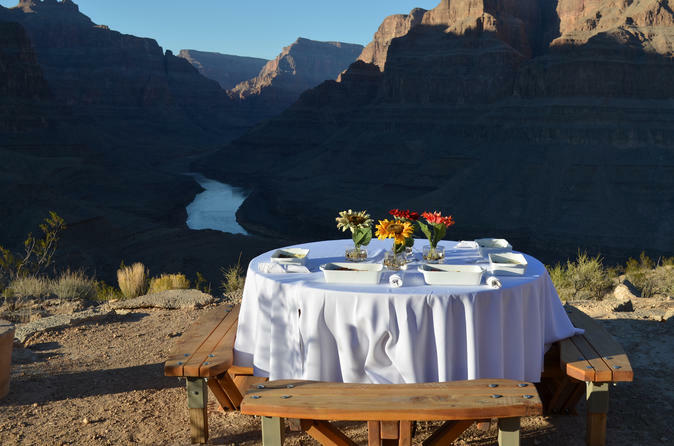 Land in the Grand Canyon West Rim for an all-out breakfast complete with fine china, table linens and flower decorations. Sip mimosas, savor a gourmet breakfast and be treated to gorgeous views over the Grand Canyon. 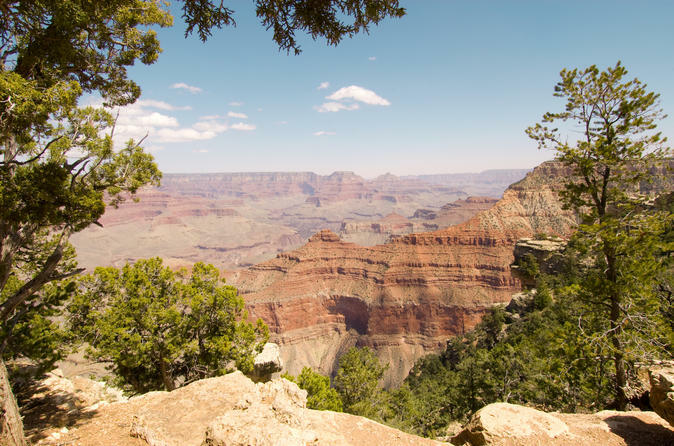 If you're traveling during the summer months, this is a perfect option to see the Grand Canyon while beating the desert heat.This exclusive Viator tour can’t be booked anywhere else! This 10-hour small-group tour takes you to one of the great natural wonders of the world. In addition to a magnificent helicopter flight and landing at the bottom of the Grand Canyon, your luxury tour vehicle stops at the magnificent Hoover Dam, the amazing 900-year-old Joshua Tree Forest, Eagle Point and Guano Point at Grand Canyon West, a wonderful picnic lunch at the rim of the canyon and then a fun visit to the Hualapai Ranch and western town. Get six great experiences in one amazing tour. 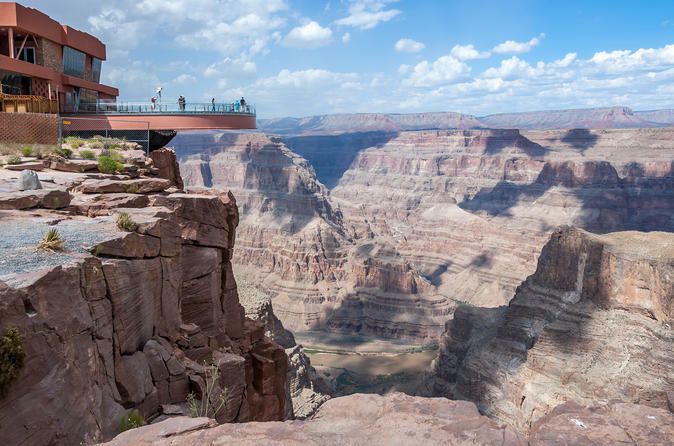 Explore the wildest and deepest part of the Grand Canyon on this day trip from Las Vegas. Travel through the Mojave Desert, across the Colorado River and along famous Route 66 until you reach the canyon, where you’ll take a narrated coach tour and experience the South Rim’s highlights. See towering rock formations, stop for scenic walks along the rim, and enjoy a picnic lunch while admiring the views. Your knowledgeable guide will ensure a comfortable, informative and enlightening experience. Upgrade to include a exhilarating helicopter tour to catch even more stunning views! Fly by EC-130 helicopter to the Grand Canyon for a champagne picnic, 3,200 feet (960 meters) below the canyon rim. 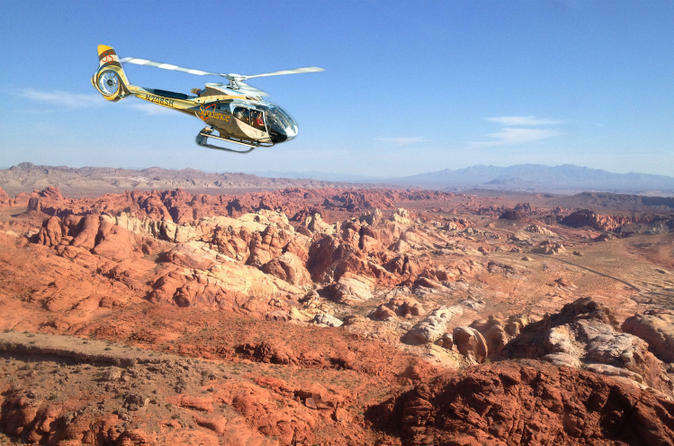 On this special VIP helicopter tour from Las Vegas, you'll not only visit the Grand Canyon West Rim but also fly through the spectacular Valley of Fire. This is a half-day tour, leaving you with time in the day free to explore Las Vegas and Nevada at your leisure. Travel from Las Vegas to the West Rim of the stunning Grand Canyon on this wonderfully scenic day trip. Pass through the Mojave Desert, dense forests of Joshua trees, and the Black Mountains en route to the Grand Canyon. Spend 4 hours exploring the West Rim hiking to panoramic overlooks and touring the Old West – inspired Hualapai Ranch. 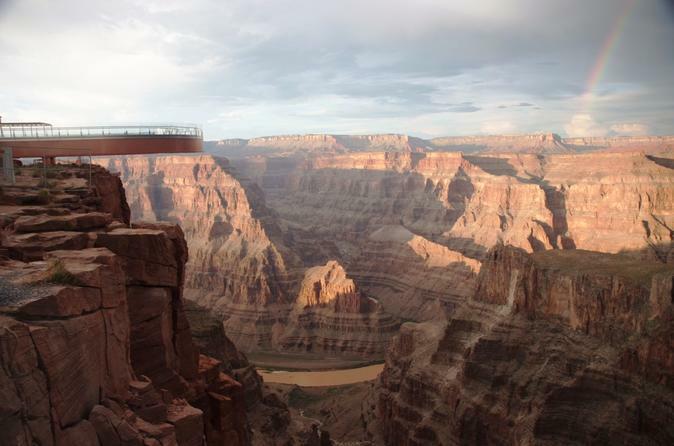 Upgrade to add on a thrilling walk on the glass-bottomed Skywalk or helicopter flight through the canyon. This small-group tour is limited to nine people for a more intimate experience. Make your special day even more memorable! 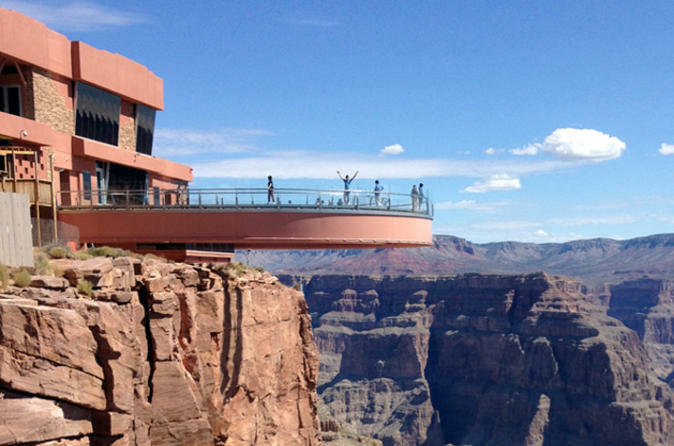 Say "I do" in the Grand Canyon and fly from Las Vegas in a six-seater helicopter. All the arrangements are made for you, and you can even have an Elvis or Johnny Cash impersonator perform the ceremony (additional cost). 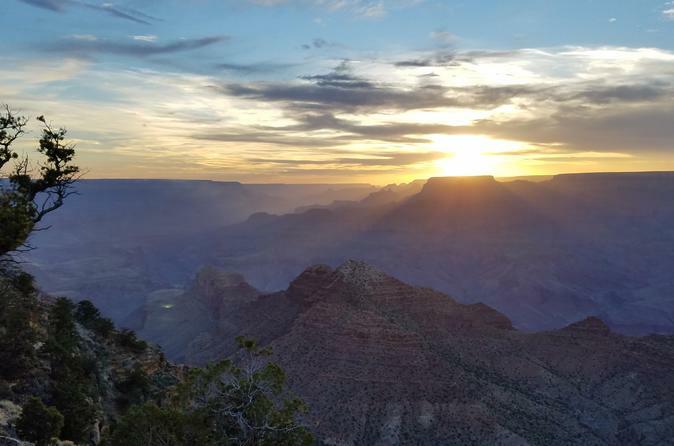 The 3-hour South Rim VIP Tour takes you to the most famous areas of the Grand Canyon National Park where, from the most picturesque viewpoints you can view the widest and deepest parts of the canyon. Photo stops at Hoover Dam, Route 66 Train Museum, Mather Point, Yavapai Point & Bright Angel Point with additional free time to browse the Bright Angel Lodge and gift shop. You also have the option of romantically picnicking your way along the amazing the Rim Trail to these three famous viewpoints. 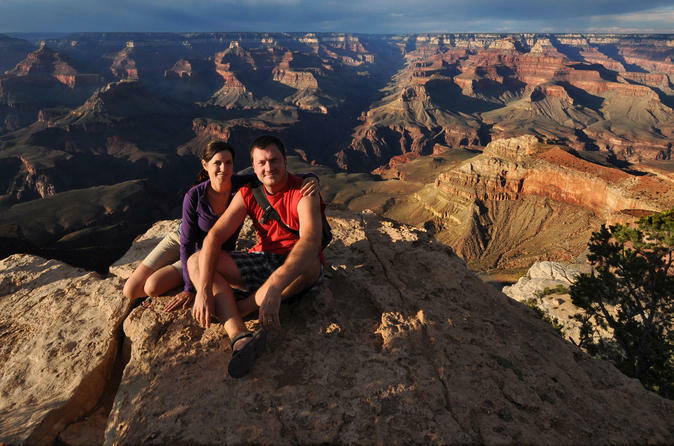 The professional and entertaining driver/guides captivate passengers with a wealth of information on the Grand Canyon and the wonderful American Southwest. Take flight and soar over Lake Mead and along side Hoover Dam en route to the Grand Canyon, where you'll land at a peaceful and secluded airport near Bar 10 Ranch on the canyon's North Rim, a less-visited part of the canyon that provides a unique vantage point of Grand Canyon National Park. If you selected the ATV option when booking, you'll explore the canyon rim on an all terrain vehicle, following a guide along a 4x4 trail through Whitmore Canyon and Lake Mead Recreation Area. As you perch 3,000 feet (880 meters) above the Colorado River, admire the sheer drop of the canyon walls and soak up the incredible views. You can also spot the interesting desert vegetation and look for local wildlife. 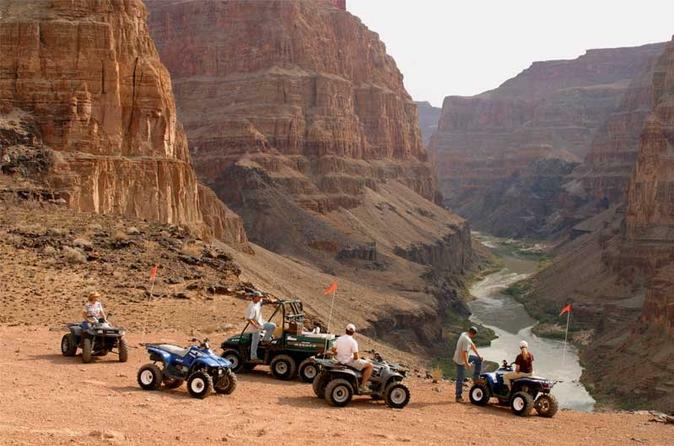 If you did not select the ATV option, you'll enjoy a guided Polaris Ranger tour to the canyon edge that includes multiple stops on the rim for photo ops. Only guests of Bar 10 Ranch have access to this area, so you can expect to experience rare views of the canyon. 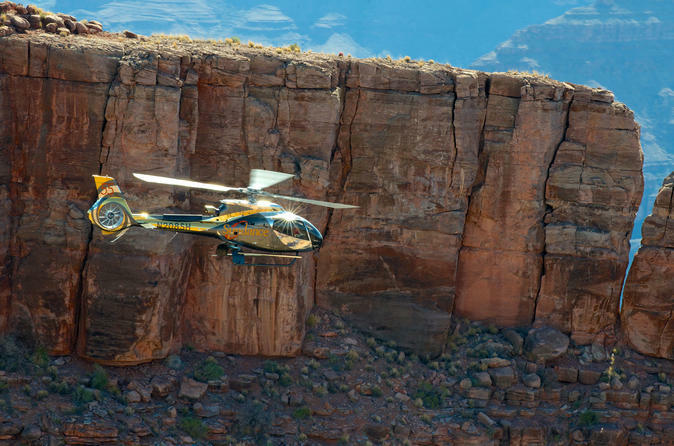 Take your Grand Canyon vacation to the next level with this helicopter tour over the National Park. You have the choice of 2 helicopter tours - either a 25-minute or 45-minute tour that will fly you over the widest and deepest parts of the canyon. You will fly in a state-of-the-art EC-130 Eco Star helicopter, which is the quietest and most eco friendly helicopter around.